I’ve been an Alia Bhatt fan since Student of the Year. But recently, I’m loving this starlet even more. Her latest movie Kalank is about to release. Even if I’m not all that gung-ho about the movie, it’s Alia Bhatt’s Indian Looks from the promotions that have caught my eye. It looks like she is going from one wedding into another wearing the most fabulous Indian Wear. Read not lehengas. But gorgeous anarkalis, and Kurtis and you know other indo-fusion wear. The reason why I’m sharing this today with you’ll is because Alia Bhatt wore different designer outfits to these promotions. There are some amazing (new) labels that you should check out from this post. Oh, and did I tell you? I have few Alia Bhatt’s Indian Looks Outfit Prices as well 🙂 I bet now you’re interested. Curated and handspun in Northeast India, this gold and ivory ensemble is especially close to our hearts. It’s a loving amalgam of our signature gota patti work with fine Assamese eri silk, designed to support local artisans in this often overlooked part of our country. A rich silk suit embellished with intricate embroidered floral motifs inspired the forests of Rajasthan. The Laranya Suit features a deep round neckline, thin shoulder straps and is paired with an embroidered tulle sharara and dupatta in Benares silk. One of my favourite looks primarily because of that colour. The purple eggplant shade looks so unique even though the outfit is otherwise quite heavy on the eyes. Alia Bhatt looks like a doll with her perfectly done hair and minimal makeup. It’s the perfect wedding guest outfit look. If you love silk, but want a modern silk look, then there is no better place to shop than Ekaya Banaras. This defence colony Indian wear store is the perfect place to shop for dupattas, silk lehengas, sarees and even some festive ethnic wear. I was doing a bit of snooping around when I came across the same Ekaya Banaras red dupatta being sold. If you are wondering what Alia Bhatt’s Ekaya Banaras outfit costs, here’s some idea. I know this is not the exact same dupatta. But you get the idea right? Now, Defence Colony is slightly on the expensive side. You will find all the top premium designer stores here. But if you have an INR 50k to INR 1 Lakh lehenga budget, Ekaya Banaras is a good place to stop by. They also keep silk sarees starting at INR 20k. I searched everywhere but I couldn’t find the price of this for you’ll to see. But from what I understand most of Punit Balana’s outfits like these come at a price of INR 25k to INR 50k a piece. The best part about Alia Bhatt’s Indian Looks is that they are all so-so wearable. Simple, classic designs with obviously designer tags on them. But you can take away so much from her looks. The way she is styling her hair, the chunky jewellery, the makeup and her accessories. They are all very well put together. A peach chiffon suit, intricately embroidered with dori, pearls, sequins and kaddana work. The Amani Suit is perfect for that springtime sangeet and features a scoop neckline, paired with a chanderi silk churidar and embroidered net dupatta. Intricately hand embroidered with motifs that reflect the majestic forests of Rajasthan, the classic black Saira Suit features a round neckline, full sleeves and is paired with a sharara. Over the last few years, Alia Bhatt has worn so many Sabyasachi outfits. From lehengas, to sarees, and now this fun off-shoulder top coord set. She looks fantastic in every style. While researching for this post, I accidentally came across another Sabyasachi lehenga price. I know this is not the place to be sharing it in this post, but really do you mind? Remember Alia Bhatt wore a gorgeous lime green Sabyasachi lehenga while attending Sonam Kapoor’s wedding reception. Ya, the same one where she walked in with beau Ranbir Kapoor. Well now, you know the price of that lehenga. You’re welcome btw. The problem is, I cannot confirm if the pricing is right in this case. So if any of you’ll have an idea, do let me know if I’ve got this right. So many brides since then have been seen wearing various shades of this beautiful Sabyasachi lehenga from the 2018 collection. 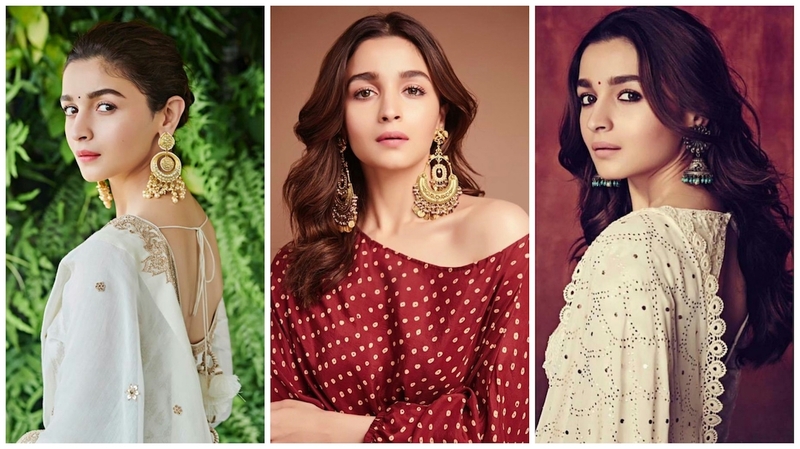 Which Alia Bhatt’s Indian Looks was your favourite from this list?